It also didn't help that investors were spooked about the potential of oil prices sliding again. 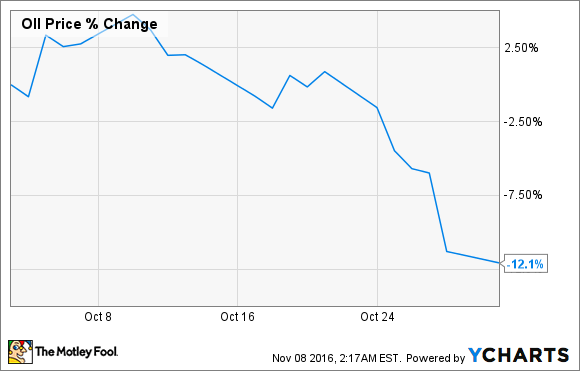 Shares of Oceaneering International (NYSE:OII) declined 12% in October. While there was a modest downturn in the overall oil and gas market due to some murmurings that OPEC might not cut production after it said it would in September, the biggest reason for Oceaneering's stock slide was the company's less-than-impressive earnings report on Oct. 27. Without getting into too much detail about the goings-on in the oil market, the thing to keep in mind with Oceaneering is that its business is intimately tied to offshore oil and gas activity. As the cost of developing shale has declined precipitously, offshore drilling now produces some of the highest-cost barrels of oil, which means that offshore drilling will likely be one of the last places to see a pickup in activity. At today's oil and gas prices, the chances of seeing more offshore activity seems low. If oil prices were to slide again for any reason, most offshore work would be too expensive to complete. That delay is something that Oceaneering can't really afford right now. On an adjusted basis, the company generated a positive net income result, but total revenue for the quarter declined 26% year over year, and CEO Kevin McEvoy predicts that things are going to get worse before they get better. The bright side for Oceaneering is that its balance sheet is still in great shape. The company has over $440 million in cash on hand and about $800 million in total debt outstanding, so there is still plenty of cushion to withstand more financial pain as it waits for the offshore drilling market to improve again. That said, investors need to understand that this turnaround is still a ways off, and it will take an immense amount of patience to reap the rewards of an investment in Oceaneering International.